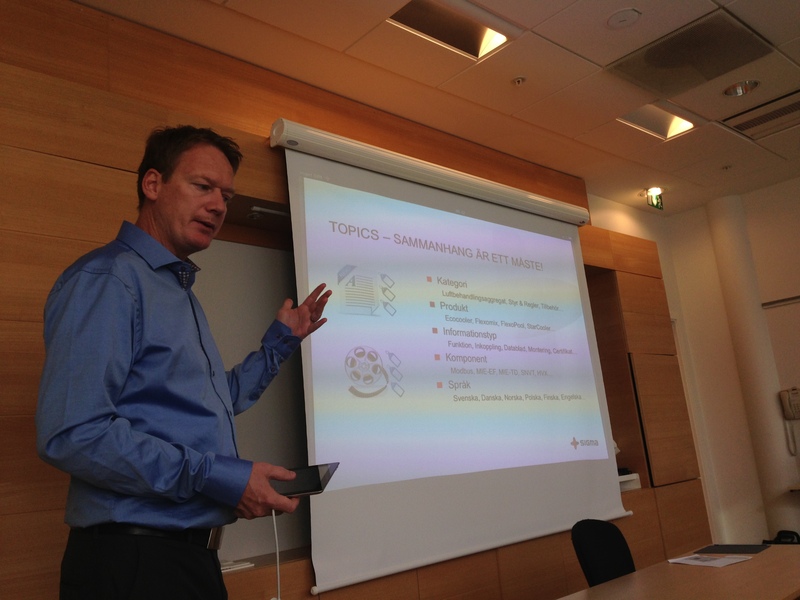 Yesterday, Sigma Technology in Linköping held a breakfast seminar about smart mobile technical information. Tomas Eriksson, techncial manager for DocFactory, talked about one of the solutions Sigma Technology has developed for IV Produkt, and the processes involved in creating this solution. The solution involves using our information management product, SmartShare, and has helped IV Produkt go from using printed documentation, to a mobile web application that uses both topics and QR codes to sort and find information. Tomas asked some important questions: Why do we write product information? Who do we write product information for? Who reads our product information, if anyone? Can we monitor the use of our product information? Is XML the best tool for writing? He then went on to answer these questions, and show alternatives to some solutions. Tomas showed an example using trackers to see how often which documents in a library are used, and by which type of user. Tomas stressed that topics don’t need to be written in XML, and that advanced techniques have no purpose of their own. Some of these points were incredibly fascinating, and raised quite a few questions and discussions after the seminar. By merely changing the way we look at product information is the first step to improving it. We would like to thank Tomas for delivering such a great presentation, as well as all the attendees for listening so intently and making the seminar a success.